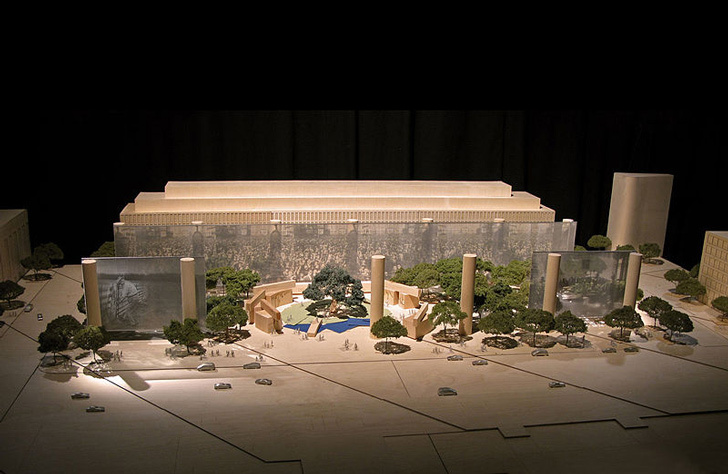 Frank Gehry is no stranger to controversy, sometimes wrongly and sometimes for good reason, but the rejection of his plans for the President Eisenhower Memorial in Washington, D.C. is a new kind of controversy. 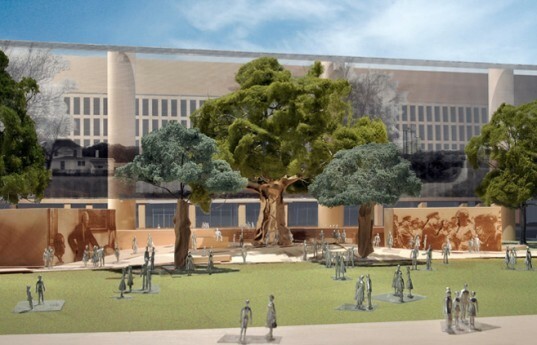 The proposed plan is being resoundingly rejected by Eisenhower’s Family and many more, not for its radical design or even for its non-traditional materials, but for how the memorial depicts Eisenhower as a Kansas boy instead of the leader of the western world. The green lining to the design though is a robust vegitated space placed at the heart of the memorial. Gehrys winning of a closed completion to tell Eisenhower’s story on the National Mall seemed straight forward enough. He took a four acre site on the mall and dotted it with metal weavings depicting Eisenhower’s life, each of which hangs off 80-foot tall non-descript columns. The proposal could be considered one of Gehry most restrained assignments, and one that is more linear than anything we have seen from him is a long time. In the center will be a statue of a Kansas-born young and shoeless Ike looking over the story of his life. The unsophisticated rendering of the supreme allied leader and two term president has rankled the Eisenhower family and other luminaries to the point where they are seeking congressional action to stop the publicly funded memorial in its tracks. The controversy does seem to play to Gehry’s weakness, which is his lackluster and often non-existent use of context in design. While the content of the design is in question, another unusual aspect to Gehry’s design is the heavily wooded park placed in the middle of the memorial, framed on all sides by the large metal tapestries. That element is not in question and is a fresh look compared to the endless stretches of white marble plazas and benches so often assigned to memorials in D.C. Only the timeless Maya Lin’s Vietnam War Memorial rests with nature more agilely.